To make it easier for me to pin the recipes on your blog to the Food on Friday pinboards and other Pinboards, please put a pin it button on your sidebar. This is how you do it. You need to go to your Dashboard and then to Layout and add a gadget - the one you want is Configure HTML/Java Script. One last point, if your post doesn't have at least one reasonably sized image, Pinterest won't let me pin it. Great! I want this code for such long time. I hope I manage to get it done in my blog easily. Thanks! New follower from the Friendly Friday hop! We are new to blogging and need all the tips we can get! Hi I'm your latest follower from the Weekend Social Mix Blog Hop! Wow your blog is so useful for techno illiterates like moi. I'm the author of fun parenting book Cocktails at Naptime www.cocktailsatnaptime.blogspot.com Come over and say hi and let's have a cocktail together! I love, love love all of your tips. thanks, always. Found you on the ILMP blog hop. This is a fab post and Im off to add it in right now! Thanks so much!! Following too. I just wonder how am I going to add Pin It button after my post. It just doesn't work on my blog instead I just put it in my sidebar. I am not sure if its because I am using firefox. Hope you can help me. Thanks for sharing this helpful tip!! Hi there! Thanks for the blog tips! I am new to this and need all the help I can get! New follower here from the blog hop! Would love a visit from you over at Moms Surviving Kids! Thanks for the great tips! Visiting from a blog hop. I cant wait to subscribe and get all this great info right into my inbox! Your blog is full of good information. Thanks for sharing this with us. I look forward to learning more. Im one of your new followers. I would love for you to follow me back! If I want to put the "Pin It button" for every post I should place the code in every post that I write right? Is there any way the "pin it button" will appear automatically after each post or pictures that I uploaded? 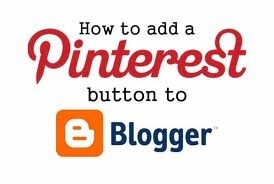 Vivian - re Pin It button - if you go to your Dashboard - Settings- Posts and Comments - you will see a box called Post template - if you copy the Pin it code into there it should put a pin it button into all new draft posts going forward. It did for me anyway. Good luck.